Healthy Chicken Burger Bowls with Tangy Sauce. We have a feeling you’re gonna LOVE these Healthy Chicken Burger Bowls with Tangy Sauce. Not only are they a super quick and easy healthy dinner recipe, they’re freaking delicious! It’s a whole family pleasing kinda dinner! Like most of our recipes it’s the perfect meal to cook when you’re short on time. Or simply not in a cooking mood. This recipe is a sneak peek from our Make Life Merry Summer Challenge. If you’re ready to kick start your healthiest year yet, our Make Life Merry Challenge is for you! 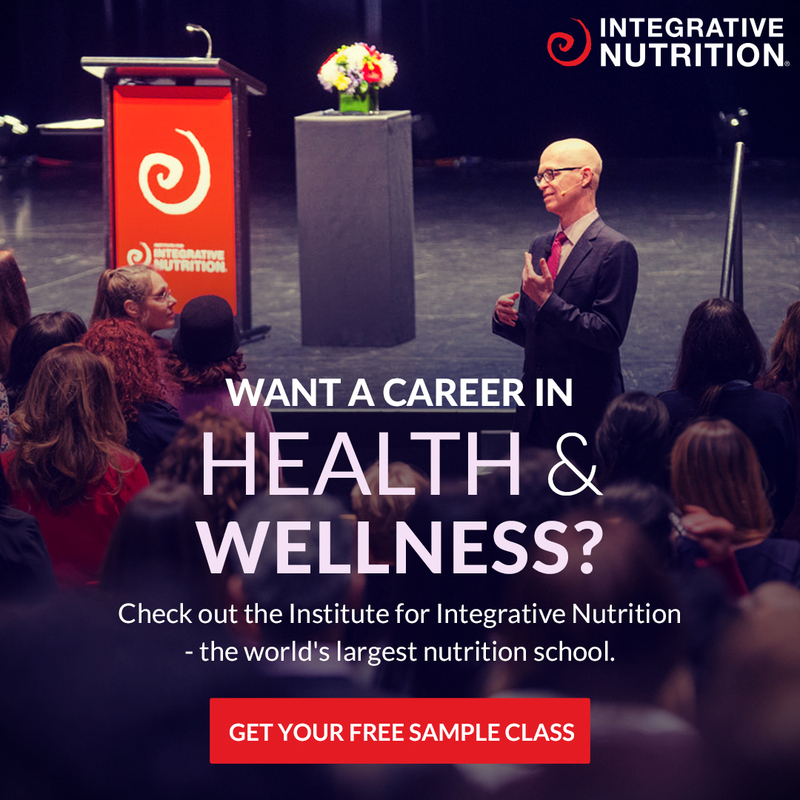 With meal plans, new recipes, shopping lists, expert webinars and more. It starts 11 January and we’re SO EXCITED! This recipe might be our favourite but believe us it was a tough choice. We’ve got meatloaf with Mexican street salad, Greek lamb meatballs and epic Merrymaker salads for dinners. For brekky you’ll enjoy low fructose salted caramel smoothies (yes! ), lemon and butter crepes and paleo soldiers (toast) with perfectly soft boiled eggs. And don’t you worry, we didn’t forget about dessert! We’ve got 2 delish healthy sweet treats… raw cookies and cream bites and delicious mango and vanilla ice cream bars. Drooling yet? Are you ready to Make Life Merry?! 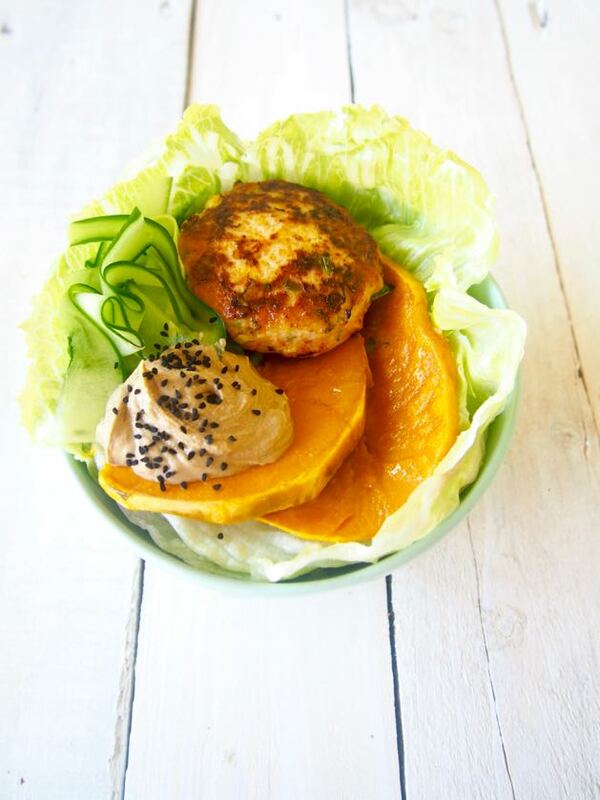 Ok back to these yum as Healthy Chicken Burger Bowls! We don’t know about you… but we really don’t miss the burger bun with our burgers. It’s all about what’s on the inside anyway… right? Well this burger has a whole lotta good stuff happening on the inside! Firstly, chicken burgers really do rock (but feel free to swap to a beef burger if you want!) and with the addition of this paleo tangy sauce get ready for party in mouth action. 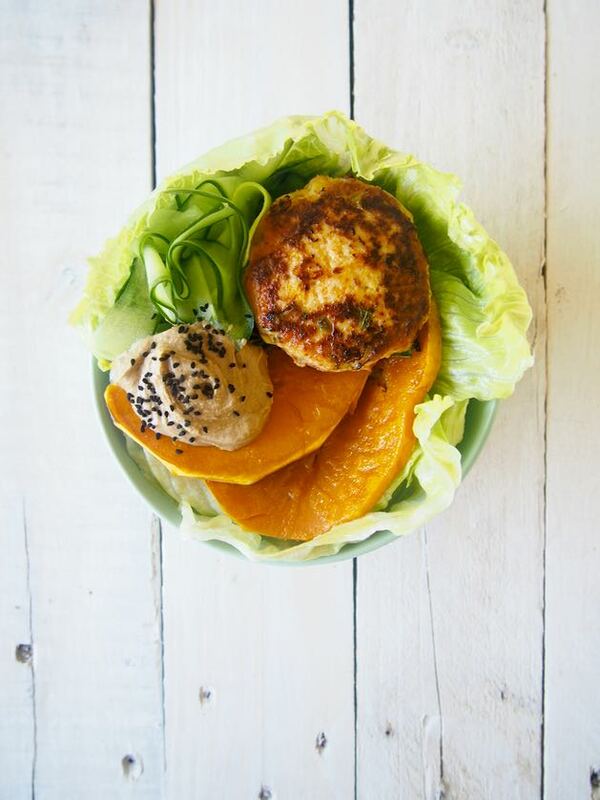 Let us know what you think about these healthy chicken burger bowls. We’d love to hear about your Merry burger bowl experience! 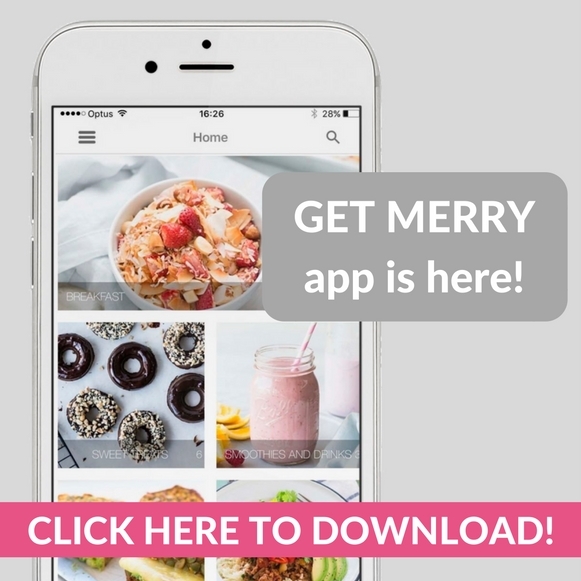 p.s if you’re still thinking about Make Life Merry… well learn more here! Place the pieces of pumpkin, drizzle with cooking oil and season with salt and pepper. Place into the oven for 20 minutes or until cooked to your liking. In a large bowl combine the chicken mince, shallots, egg, coriander and carrot. You might need to get your hands dirty! Add the coconut flour, paprika and salt and pepper. Mix well. Use a ⅓ measuring cup to split the mince into 8 even portions and roll into patties. Melt a little coconut oil in a medium heat fry pan. Add the patties to the fry pan and cook for around 6-8 minutes. Flip and cook for a further 3-4 minutes or until cooked through. For the sauce, in a small bowl mix the tahini, aminos and lemon juice. 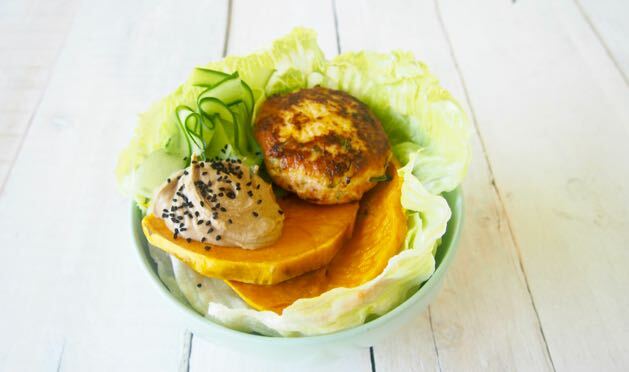 To serve, place a lettuce cup in a bowl with the chicken burger, roast pumpkin, cucumber and tangy sauce (we sprinkled ours with nigella seeds, totally optional, totally yum). Swap the chicken to lamb, pork or beef mince! Anything goes!